Predominantly black northeast Oklahoma City is plagued by abandoned and vacant homes such as this one. 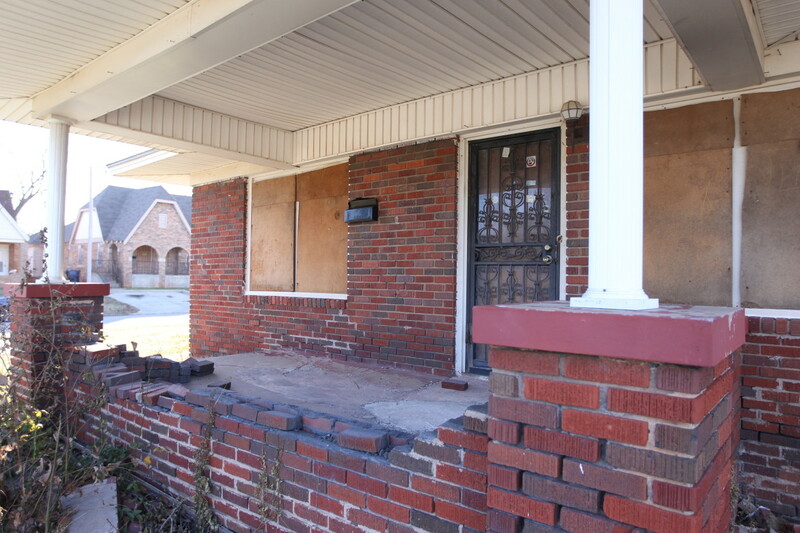 Predominantly black northeast Oklahoma City is plagued by abandoned and vacant homes. Recent controversy over a racist chant at a University of Oklahoma fraternity focused attention on the state’s race relations. But the numbers beneath the headlines perhaps cast a longer shadow. By almost every metric, blacks struggle in most of the quality-of-life factors in the state. Oklahoma is first in the nation, per capita, for blacks to die at the hands of police officers among states reporting. Blacks are about half as likely to own a home, are more likely to go to prison, less likely to go to college and less likely to graduate. This chart shows Oklahoma’s racial demographics, and can serve as a point of comparison for the following charts. Blacks in Oklahoma are more likely to be the victims of a crime or charged with a crime when compared with other racial groups in Oklahoma. This has created a stressful dynamic where some in the black community want to see better policing to keep their neighborhoods safe, but they also feel unfairly targeted by police, which breeds mistrust. Family breakdown, socioeconomic challenges within urban schools and higher rates of school punishment are intertwined with higher juvenile arrest rates of black students for violation of zero-tolerance policies. This helps create the so-called “school-to-prison pipeline” by pushing students out of school. In this chart: the racial breakdown of those who are incarcerated, on parole or on probation. This chart shows the racial breakdown of juveniles arrested in 2013. This chart shows the racial, ethnic and religious breakdown of hate crime victims in 2013. This chart shows the racial breakdown of Oklahoma homicide victims in 2013, and those charged with committing homicide. Poverty plays a large role in lower quality-of-life measurements for blacks and other minorities in Oklahoma. This is reflected in lower homeownership rates and higher poverty rates and unemployment rates. This can lead to the degradation of certain neighborhoods, which then require huge investments for recovery even as a city is concentrating many resources elsewhere. Northeast Oklahoma City, which has a large black population, continues to suffer from blight and deterioration, and some residents express resentment of the investments made downtown. City leaders have taken recent steps to try to revitalize parts of the area. This chart shows Oklahoma’s unemployment rates by race in 2013. The percentages of Oklahoma families in poverty by race. Minorities are underrepresented in Oklahoma’s flagship universities: the University of Oklahoma and Oklahoma State University. Both schools also draw in a relatively small number of students from the state’s largest school districts, which have the most minority students: Oklahoma City and Tulsa public schools. Both universities also struggle to retain and graduate minority students compared with white students. OU’s and OSU’s struggles are not unique. Universities across the nation struggle with retention and graduation rates for minority students. Some experts say the problem reflects the underachievement of minority and low-income students in grade school — the achievement gap. Here are Oklahoma’s 2014 graduation rates by race. This chart shows the highest degree attained by race. This chart shows the six-year graduation rate at both universities, broken down by race. Of the 149 members serving in the Oklahoma Legislature during 2015, four, or 2.7 percent, are Black. One seat remains open.